1. Destroy all the spy cameras in the level. 2. Get through the level without taking a health hit. 3. Finding every weapon on a level. 4. Getting all the merchandise in a level. 5. Destroy all the spinning guns in a level. 6. Destroy all the napalm bombs in a level. 7. Shooting all the crystal balls, and not touching them in a level. 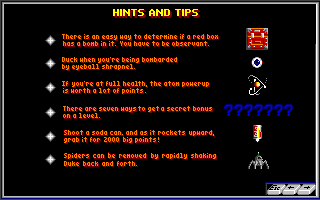 Below is a picture and the original hint document that comes with the registered version of Duke Nukem. the game for a graphical representation of what these weapons look like. bonus points! Once again, see the game help for what these objects look like! it. If the red box has a coke can in it, you will walk in front of the box. If it has a bomb in it, you will walk behind the box. - Duck when you're being bombarded by eyeball shrapnel. really quickly. Don't let them stay on you! of them, to be exact! - Collect the letters N-U-K-E-M in order for a special 100,000 point bonus! a bonus, but it will only be 10,000 points. worth 100,000 points, and you will collect them at the end of a level. 1 � Destroy all the spy cameras in the level. 2 � Get through the level without taking a health hit. 3 � Finding every weapon on a level. 4 � Getting all the merchandise in a level. 5 � Destroy all the spinning guns in a level. 6 � Destroy all the napalm bombs in a level. 7 � Shooting all the crystal balls, and not touching them in a level. approaching them, try and jump and remain in the air. default weapon. Duke's ship can also destroy these turret guns. better get the coke can, or you'll lose it! these objects look like inside the online help within the game. going up against a boss creature. how much health you had at the end of the previous level. be used as many times as you wish. [E] [A] [T] - Gives you full health, but it also resets your score to zero. that you need to finish the particular level you are on. Please note that these only work in the commercial version of Duke Nukem II. These codes do nothing in the shareware version of the game.